WE MAY AMEND THESE TERMS. ANY SUCH AMANDMENT WILL BE EFFECTIVE THIRTY (30) DAYS FOLLOWING OUR DISPATCH OR A NOTICE TO YOU OR OUR POSTING OF THE AMENDMENT ON THE BNB CHAT SERVICES. IF YOU DO NOT AGREE TO ANY CHANGE TO THESE TERMS, YOU MUST DISCONTINUE USING THE BNB CHAT SERVICES. WE MAY IMMEDIATELY TERMINATE THIS AGREEMENT WITH RESPECT TO YOU (INCLUDING YOUR ACCESS TO THE BNB CHAT SERVICES) IF YOU FAIL TO COMPLY WITH ANY PROVISION OF THESE TERMS. FAILURE TO USE THE SOFTWARE IN ACCORDANCE WITH THE TERMS AND CONDITIONS SPECIFIED HEREIN MAY SUBJECT YOU TO CIVIL AND CRIMINAL PENALTIES. ANY DISPUTE BETWEEN YOU AND US MUST BE RESOLVED BY INDIVIDUAL BINDING ARBITRATION. PLEASE READ THE ARBITRATION PROVISION IN THESE TERMS AS IT AFFECTS YOUR RIGHTS UNDER THIS AGREEMENT. YOU ARE NOT AUTHROIZED TO DOWNLOAD OR USE OUR SOFTWARE UNLESS YOU ARE AT LEAST 18 YEARS OF AGE AND ABLE TO ENTER INTO A LEGALLY BINDING CONTRACT. FEDERAL TAX LAW - IRS.GOV: IF A TAXPAYER RENTS HIS/HER PERSONAL DWELLING UNIT FOR LESS THAN 15 DAYS DURING THE TAXABLE YEAR, (“DE MINIMIS RENTAL”) ITS PRIMARY FUNCTION IS NOT CONSIDERED TO BE RENTAL. YOU ARE NOT REQUIRED TO REPORT ANY OF THE RENTAL INCOME AND FORBIDDEN FROM CLAIMING ANY BUSINESS EXPENSES AGAINST ANY DE MINIMIS RENTAL REVENUE. IF YOU RENT YOUR DWELLING MORE THAN 14 DAYS DURING THE YEAR, YOU MAY BE CONSIDERED A HOTEL OPERATOR AND REQUIRED TO OBTAIN A BUSINESS LICENSE, CITY PERMIT, PAY TRANSIENT OCCUPANCY TAXES (TOT), HOTEL TAXES, PROVIDE PROOF OF RESIDENCY, MAINTAIN COMMERCIAL LIABILITY INSURANCE, OBTAIN A REGISTRATION NUMBER FROM YOUR LOCAL PLANNING AUTHORITY, REPORT NUMBER OF DAYS OF SHORT-TERM RENTAL ACTIVITY ANNUALLY, POST LOCATION OF FIRE SAFETY EQUIPMENT, FIRE ALARMS AND EXITS. YOU AGREE IT IS YOUR SOLE RESPONSIBILITY TO REVIEW IRS PUBLICATION 527 HTTP://WWW.IRS.GOV/PUB/IRS-PDF/P527.PDF AND YOUR INDIVIDUAL ROOM RENTAL AVAILABILITY AND USAGE WITH A TAX AND LEGAL PROFESSIONAL. NOTHING CONTAINED HEREIN SHALL BE CONSTRUED AS TAX ADVICE. GETTING ANSWERS TO YOUR TAX LAW QUESTIONS CAN BE OBTAINED AT IRS.GOV. Accessing our Software and Services requires you to become a (“Member”) by providing us with a current email address and unique password. You are responsible for taking all reasonable steps to protect and maintain the confidentially of your email address and password, and take full responsibility for all activities under your account. You agree it is your sole responsibility to provide and maintain true, accurate, current and complete information for notices and other communications from us and other users of our Software. You agree not to impersonate or misrepresent your affiliation with any person or entity, including using another person’s email address or password. If you provide any information that is, or we have reasonable grounds to suspect that the information is, untrue, inaccurate, not current or incomplete, or fail to comply with any provision of these Terms, BnB Chat may without notice suspend or terminate your access to our Software and Services. (“Identify Verification”) on the Internet is very difficult. We do not assume any responsibility for any user’s purported identity. You agree to immediately notify BnB Chat of any unauthorized use of your password or account or any other breach of security. The security, confidentially, and integrity of your account information is extremely important to us and will take reasonable steps to help ensure the safety of your personal identifying information. You acknowledge and agree that such steps do not guarantee that use of our Software is invulnerable to all security breaches, and that BnB Chat makes no warranty, guarantee, or representation that use of any of our Services is protected from viruses, security threats or other vulnerabilities. You acknowledge and agree that under no circumstances shall BnB Chat be held liable to you for any liabilities or damages resulting from or arising out of (i) any action or inaction by BnB Chat under this provision, (ii) any compromise of the confidentiality of your account or password and (iii) any unauthorized access to your account or use of your password. You may not use anyone else's account at any time, without the permission of the account holder. Copyright laws and international copyright treaties, as well as other intellectual property laws and treaties protect the Software, Services and Website. All ownership rights in the Software and Services, including content, trademarks, trade names, service marks and any new releases, modifications, and enhancements thereto belong solely to BnB Chat and its licensors, including all intellectual property rights therein. You agree not to copy, modify, transmit, make use of, or reproduce in any way any copyrighted material, trademarks, trade names, service marks, or other intellectual property information accessible through the Service, without first obtaining the prior written consent from the Company or, if the property is not owned by the Company, the owner of such intellectual property or proprietary rights. You agree not to remove, obscure or alter any proprietary notices appearing on the content, including copyright, trademark, service mark and other intellectual notices. The Software includes trade secrets and information that is confidential and proprietary to BnB Chat and you agree to take all necessary actions to protect the confidentiality of such information. The Software is licensed, not sold. Title does not pass to you. There is no implied license, right or interest granted in any copyright, patent, trade secret, trademark, service mark, invention or other intellectual property right. BnB Chat hereby expressly reserves all rights in the Software and all Services, which are not expressly granted to you hereunder. a.) YOUR USE OF OUR SOFTWARE AND SERVICES, INCLUDING ANY CONTENT OR INFORMATION CONTAINED WITHIN, IS PROVIDED TO YOU ON AN “AS IS” BASIS, AND AT YOUR SOLE RISK. BNB CHAT AND ITS CO-BRANDERS, SUPPLIERS, LICENSORS, AND OTHER RELATED PARTIES, AND THEIR RESPECTIVE OFFICERS, AGENTS, REPRESENTATIVES, AND EMPLOYEES EXPRESSLY DISCLAIM ALL WARRANTIES OF ANY KIND, WHETHER EXPRESS, STATUTORY OR IMPLIED, INCLUDING, BUT NOT LIMITED TO THE IMPLIED WARRANTIES OF MERCHANTABILITY, FITNESS FOR A PARTICULAR PURPOSE, TITLE, ACCURACY OF DATA AND NON-INFRINGEMENT. b.) 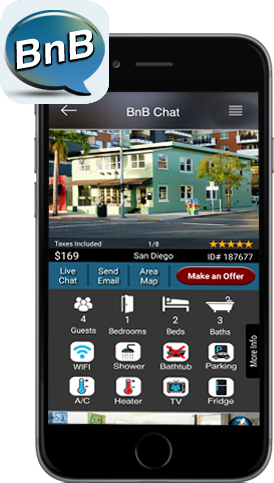 BNB CHAT AND ITS CO-BRANDERS, SUPPLIERS, LICENSORS, AND OTHER RELATED PARTIES, AND THEIR RESPECTIVE OFFICERS, AGENTS, REPRESENTATIVES, AND EMPLOYEES MAKE NO WARRANTY THAT (i) OUR SOFTWARE OR SERVICES WILL MEET YOUR REQUIREMENTS, (ii) MATERIALS, OR CONTENT AVAILABLE FOR DOWNLOAD FROM THE APPLE ITUNES STORE OR GOOGLE PLAY STORE IS FREE OF INFECTION OR VIRUSES, WORMS, TROJAN HORSES, OR OTHER CODE THAT MANIFESTS CONTAMINATING OR DESTRUCTIVE PROPERTIES; (iii) OUR SEVICE WILL BE UNINTERRUPTED, TIMELY, SECURE (INCLUDING FREE FROM UNAUTHORIZED ACCESS), PROVIDE CONTINUOUS STORAGE OR ACCESS, OR ERROR-FREE, (iv) THE RESULTS THAT MAY BE OBTAINED FROM THE USE OF OUR SOFTWARE OR SERVICES WILL BE ACCURATE, COMPLETE OR RELIABLE, (v) THE QUALITY OF ANY SOFTWARE, SERVICES, PRODUCTS, INFORMATION, OR OTHER MATERIAL PURCHASED OR OBTAINED BY YOU THROUGH OUR SITE WILL MEET YOUR EXPECTATIONS, AND (vi) ANY ERRORS IN OUR SOFTWARE OR SERVICES WILL BE CORRECTED. c.) ANY MATERIAL DOWNLOADED, UPLOADED OR OTHERWISE OBTAINED THROUGH THE USE OF OUR SOFTWARE OR SERVICES IS DONE AT YOUR OWN DISCRETION AND RISK AND YOU WILL BE SOLELY RESPONSIBLE FOR ANY DAMAGE TO YOUR COMPUTER SYSTEM OR BUSINESS OR LOSS OF DATA THAT RESULTS FROM THE DOWNLOAD OR UPLOAD OF ANY SUCH MATERIAL OR THE USE OF OUR SOFTWARE OR OUR SERVICES. d.) NO ADVICE OR INFORMATION, WHETHER ORAL OR WRITTEN, OBTAINED BY YOU FROM BNB CHAT OR THROUGH OR FROM OUR SOFTWARE OR SERVICES SHALL CREATE ANY WARRANTY. ADVICE OR INFORMATION RECEIVED BY MEANS OF OUR SOFTWARE OR SERVICES SHOULD NOT BE RELIED UPON FOR SIGNIFICANT PERSONAL, BUSINESS, MEDICAL, LEGAL OR FINANCIAL DECISIONS AND YOU SHOULD CONSULT AN APPROPRIATE PROFESSIONAL FOR SPECIFIC ADVICE TAILORED TO YOUR PARTICULAR SITUATION. IN NO EVENT SHALL BNB CHAT, ITS EMPLOYEES, OFFICERS, REPRESENTATIVES, SERVICE PROVIDERS, SUPPLIERS, LICENSORS, AND AGENTS BE LIABLE FOR ANY DIRECT, SPECIAL, INDIRECT, INCIDENTAL, SPECIAL, EXEMPLARY, PUNITIVE OR CONSEQUENTIAL DAMAGES, OR ANY OTHER DAMAGES OF ANY KIND, INCLUDING BUT NOT LIMITED TO, LOSS OF USE, LOSS OF PROFITS, OR LOSS OF DATA, WHETHER IN AN ACTION IN CONTRACT, TORT (INCLUDING BUT NOT LIMITED TO NEGLIGENCE), OR OTHERWISE, ARISING OUT OF OR IN ANY WAY CONNECTED WITH (i) THE USE OR INABILITY TO USE OUR SOFTWARE OR SERVICES OR THE CONTENT, MATERIALS, INFORMATION OR TRANSACTIONS PROVIDED ON OR THROUGH THE SERVICE, OR (ii) ANY CLAIM ATTRIBUTABLE TO ERRORS, OMISSIONS, OR OTHER INACCURACIES IN THE SOFTWARE OR SERVICES OR THE CONTENT, MATERIALS, INFORMATION, OR SERVICES ON OR AVAILABLE THROUGH THE APPLE ITUNES STORE OR GOOGLE PLAY STORE, (iii) THE COST OF PROCUREMENT OF SUBSTITUTE SERVICES RESULTING FROM ANY, DATA, INFORMATION OR SERVICES OBTAINED OR MESSAGES RECEIVED OR TRANSACTIONS ENTERED INTO THROUGH OR FROM OUR SOFTWARE OR SERVICES; (iv) UNAUTHORIZED ACCESS TO OR ALTERATION OF YOUR TRANSMISSIONS OR DATA; (v) STATEMENTS OR CONDUCT OF ANY THIRD PARTY ON OUR SOFTWARE OR SERVICES; (vi) THE DELAY OR FAILURE IN PERFORMANCE RESULTING FROM AN ACT OF FORCE MAJEURE, INCLUDING WITHOUT LIMITATION, ACTS OF GOD, NATURAL DISASTERS, COMMUNICATIONS FAILURE, GOVERNMENTAL ACTIONS, WARS, STRIKES, LABOR DISPUTES, RIOTS, SHORTAGES OF LABOR OR MATERIALS, VANDALISM, TERRORISM, NON-PERFORMANCE OF THIRD PARTIES OR ANY REASONS BEYOND THEIR REASONABLE CONTROL; OR (vii) ANY OTHER MATTER RELATING TO OUR SOFTWARE OR SERVICES, EVEN IF BNB CHAT OR ITS AUTHORIZED REPRESENTATIVES HAVE BEEN ADVISED OF THE POSSIBILITY OF SUCH DAMAGES. YOUR SOLE REMEDY FOR DISSATISFACTION WITH THE SOFTWARE AND/OR SERVICES IS TO STOP USING THE SOFTWARE AND THOSE SERVICES. APPLICABLE LAW MAY NOT ALLOW THE LIMITATION OF LIABILITY, IMPLIED WARRANTIES OR THE EXCLUSION OR LIMITATION OF CERTAIN DAMAGES SET FORTH ABOVE, SO THIS LIMITATION OF LIABILITY MAY NOT APPLY TO YOU. IF ANY PART OF THIS LIMITATION ON LIABILITY IS FOUND TO BE INVALID OR UNENFORCEABLE FOR ANY REASON, THEN THE AGGREGATE LIABILITY OF BNB CHAT UNDER SUCH CIRCUMSTANCES FOR LIABILITIES THAT OTHERWISE WOULD HAVE BEEN LIMITED SHALL NOT EXCEED ONE DOLLAR ($1). a.) Paragraph 14 applies to any dispute between you and BnB Chat or any third party including BnB Chat affiliates (collectively, “Disputed Party” or “Disputed Parties”) relating to the Software or Services or this Agreement, EXCEPT DISPUTES RELATING TO THE ENFORCEMENT OR VALIDITY OF YOUR, YOUR LICENSORS’, BNB CHAT’S, OR BNB CHAT’S LICENSORS’ INTELLECTUAL PROPERTY RIGHTS. Dispute, for purposes of paragraph 14, means any dispute, action, or other controversy whether in contract, warranty, tort, statute, regulation, ordinance, or any other legal or equitable basis. Dispute will be given the broadest possible meaning allowable under law. b.) Notice of Dispute. In the event of a dispute, you must provide BnB Chat or other Disputed Party with a Notice of Dispute, which is a written statement of the name, address and contact information of the party giving it, the facts giving rise to the dispute, and the relief requested. You must send any Notice of Dispute to BnB Chat, Inc. ATTN: ARBITRATION, 7260 W. Azure Dr., Suite 140-517, Las Vegas, NV 89130 and to any other Disputed Party at its principal place of business in the USA, marked ATTN: Legal Department. The Disputed Party will send any Notice of Dispute to your address if it has it, or otherwise to your e-mail address on file. You and the Disputed Party will attempt to resolve any dispute through informal negotiation within 90 days from the date the Notice of Dispute is sent, after which you or the Disputed Party may commence arbitration on an individual basis. c.) Small Claims Court. You may also litigate any dispute in a small claims court in Clark County, Nevada, if the dispute meets all requirements to be heard in the small claims court. You may litigate in a small claims court whether or not you negotiated informally first. d.) Binding Arbitration. If you and BnB Chat or any other Disputed Party do not resolve any dispute by informal negotiation or in small claims court, any other effort to resolve the dispute will be conducted exclusively by individual binding arbitration governed by the Federal Arbitration Act (“FAA”). Class arbitrations are not permitted. By entering into this Agreement you are waiving the right to litigate disputes in court before a judge or jury and the right to participate in court as a party or class member. Instead, all disputes will be resolved before a neutral arbitrator, whose decision will be final except for a limited right of appeal under the FAA. Any court with jurisdiction over the parties may enforce the arbitrator’s award. e.) Class Action Waiver. Any proceeding to resolve or litigate any dispute in any forum will be conducted solely on an individual basis. Neither you, BnB Chat nor any other Disputed Party will seek to have any dispute heard as a class action, private attorney general action, or in any other proceeding in which any party acts or proposes to act in a representative capacity. No arbitration or other proceeding will be combined with another without the prior written consent of all parties to all affected arbitrations or proceedings. f.) Arbitration Procedure. Any arbitration will be conducted by the American Arbitration Association (the “AAA”) under its Commercial Arbitration Rules. If you are an individual and use the Software or Services for personal or household use, or if the value of the dispute is $75,000 (US) or less whether or not you are an individual or how you use them, its Supplementary Procedures for Consumer-Related Disputes will also apply. For more information, see adr.org or call +1-800-778-7879. You agree to commence arbitration only in Clark County, Nevada. g.) One-Year Deadline for Claims or Disputes. To the extent permitted by law, any claim or dispute that you may have relating to the Software, Services, or these Terms must be filed within one (1) year in small claims court or in arbitration. The one-year period begins when the claim or dispute first could be filed. If your claim or dispute is not filed within one (1) year, it is permanently barred. h.) Rejecting Future Arbitration Changes. You may reject any change BnB Chat makes to paragraph 14 (other than address changes) by sending us notice within 30 days of the change by U.S. Mail to the address in paragraph 14. If you do, the most recent version of paragraph 14 before the change you rejected will apply. i.) Severability. If the class action waiver in paragraph 14 is found to be illegal, invalid or unenforceable as to all or some parts of a dispute, then paragraph 14 will not apply to those parts. Instead, those parts will be severed and proceed in a court of law, with the remaining parts proceeding in arbitration. If any other provision of paragraph 14 is found to be illegal, invalid or unenforceable, that provision will be severed with the remainder of paragraph 14 remaining in full force and effect. YOU EXPRESSLY ACKNOWLEDGE THAT YOU HAVE READ THESE TERMS AND UNDERSTAND THE RIGHTS, OBLIGATIONS, TERMS AND CONDITIONS SET FORTH HEREIN. BY CONTINUING TO INSTALL THE SOFTWARE OR USE THE SOFTWARE, SERVICES AND/OR BNB CHAT WEBSITE, YOU EXPRESSLY CONSENT TO BE BOUND BY ITS TERMS AND CONDITIONS AND GRANT TO BNB CHAT THE RIGHTS SET FORTH HEREIN. BnB Chat Inc. reserves the right to investigate and prosecute any violations concerning any (i) patent, copyright, or trademark infringements; (ii) deceptive, false, misleading, fraudulent claims; (iii) vulgar, obscene, pornographic, defamatory content (iv) threatening, harmful acts of violence (v) promotion of any illegal behavior or activity (vi) unsolicited commercial email (“Spam”) (vii) stalking or harassment of any User or (viii) usage of any bot, crawler, spider or other unauthorized method of retrieving data directly or indirectly from the BnB Chat Application or web site. You acknowledge that the obligations made hereunder to BnB Chat are of a unique and irreplaceable nature, the loss of which shall irreparably harm BnB Chat and which cannot be replaced by monetary damages alone so that BnB Chat shall be entitled to injunctive or other equitable relief (without the obligations of posting any bond or surety) in the event of any breach or anticipatory breach by you. You irrevocably waive all rights to seek injunctive or other equitable relief.